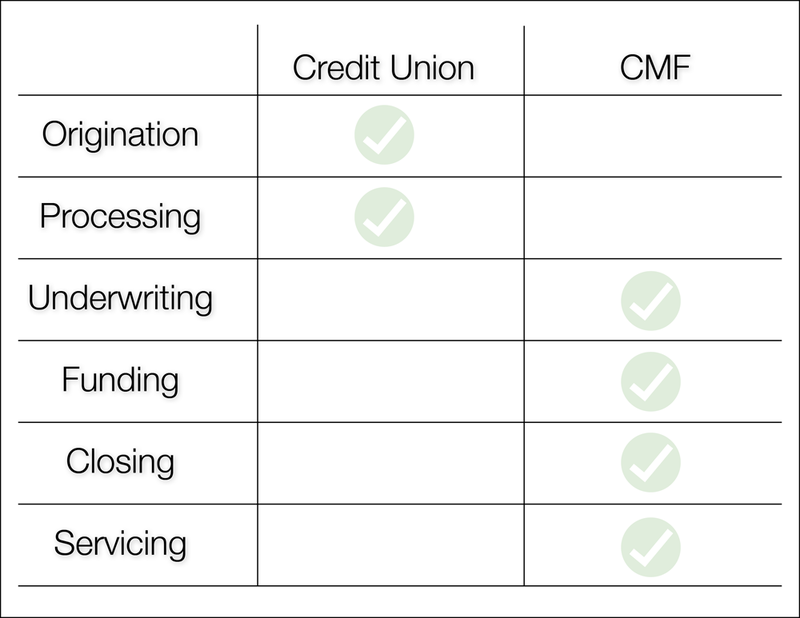 CMF is a Credit Union Service Organization (CUSO) created by credit unions for credit unions. Providing excellent home loan experiences to members is our passion and always our first priority. Being credit union owned, we have a unique understanding of what it means to provide the signature style service that your members have come to expect from their credit union. 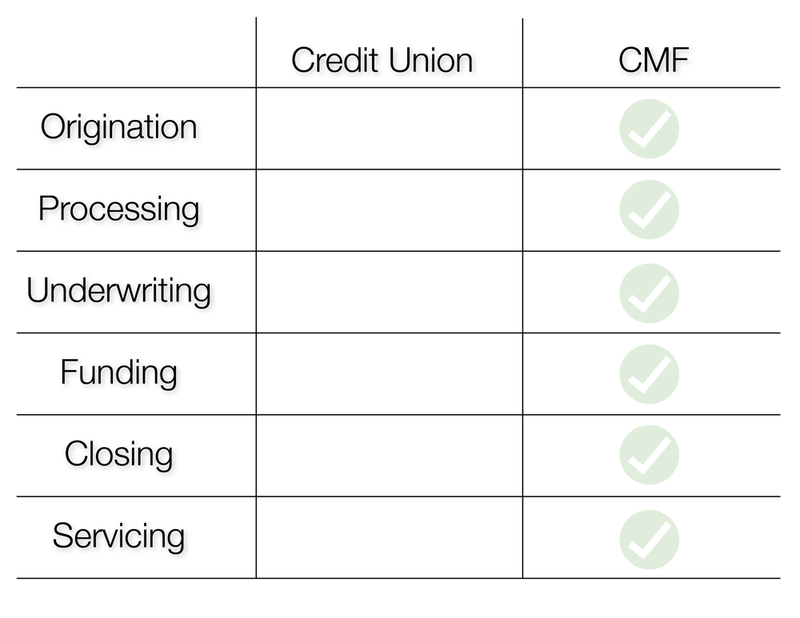 We provide several different participation options for our credit union clients, because we understand that each credit union has different goals and objectives. We know you are on the path to success, and we want to be a part of it! We look forward to the opportunity to speak with you today about how CMF fits into your business plans. Our Sales Builder Track is specially designed for credit unions who want to offer their members a great home loan experience without incurring an operational impact on their business. CMF handles all aspects of the mortgage process so you can rest easy knowing that your members' loans are being managed with special care and a streamlined process that only 18 years of experience in the industry can offer. Additionally, our online site gives you and your members a competitive advantage. In partnership with CU Realty, our Home Advantage program allows your members to search new home listings and find Real Estate Agents online, while our co-branded Real Estate Center allows them to access rates and apply online at their convenience. Our online portal, CMF Express allows you to view your pipeline of current loans so you're never left in the dark about their status. Please contact us for specific information regarding our Sales Builder track level of service. Do you want to be the first point of contact for your members? Our Relationship Builder track is designed specifically for credit unions who want to take an active role in their members' home loan process without handling all aspects of the transaction. The credit union takes the member's loan application and acts as the main point of contact during the initial application phase. CMF handles the processing and servicing functions for you in a seamless manner, so your members get the best of both worlds. Additionally, our online site gives you and your members a competitive advantage. Our CMF Home Rewards program allows your members to search new home listings and find Real Estate Agents online, while our online portal, CMF Express allows you to view your pipeline of current loans so you're never left in the dark about their status. Please contact us for more information regarding our Relationship Builder track. If you have the in-house resources to manage the origination and processing functions of your members' loans, then our Business Builder Track is perfect for you! This track allows you to perform the role of third-party originator and generate the lender's fee income for your credit union. 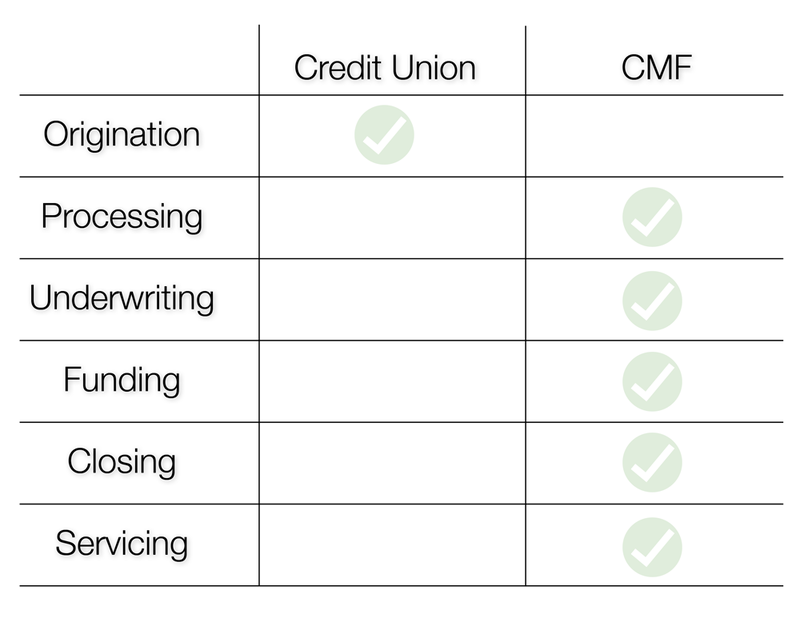 CMF handles underwriting, closing, funding and servicing functions. Additionally, our online sites give you and your members a competitive advantage. Our online portal, CMF Express allows you to view your pipeline of current loans so you're never left in the dark about their status. You can upload files directly to our systems through CMF Express as well as access the various online resources we have made available. Please contact us for more information on our Business Builder Track. CMF is dedicated to your success, and as such, is ready to offer you services outside of our business tracks. We are ready to design a custom-made business plan for you utilizing our individual services listed below. Sub-Servicing - We can handle processing of payments, taxes and insurance, investor reporting, member inquiries, collections/foreclosures, and provide 24/7 online access to our servicing site for your members. Marketing Support - You know your members best. CMF has the expertise to help you market home loans across multiple marketing channels by providing concepts and strategies that will allow you to produce a wide variety of marketing materials. Technology Support - The online world is thriving, and your members expect high-end online technology that meets their needs. Our business partners help us to make these services available to you so your member can apply online, subscribe to receive our daily interest rates by text or email, search for homes, find a realtor, earn a rebate and more! Training Support - Our seasoned staff of loan experts are ready to provide customized training to your staff on mortgage concepts, specific program information and operational processes. We also offer free Homebuyer workshops to your members who want to learn more about the homefinancing process. Please contact us for more information regarding our additional services.